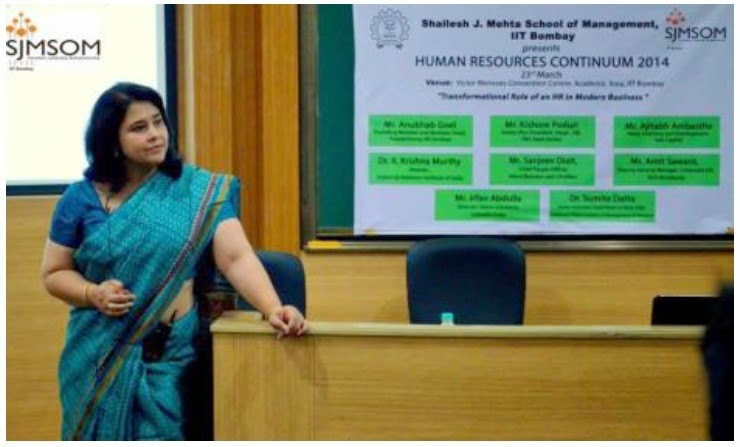 The Human Resource Continuum - 2014, which was themed Transformational Role of an HR in Modern Business, covered the latest trends in Human Resource management. The one-day event provided one of the best learning experiences for all the students. It served as a platform for the inquisitive students to get face to face with industry stalwarts. An enlightening session by an eminent speaker was followed by a round of mutual interaction between the speaker and the students. 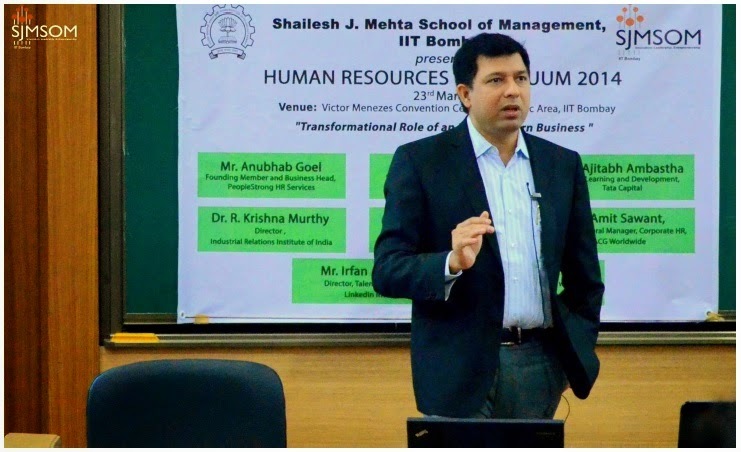 Our first speaker Mr. Anubhab Goel, Founding Member & Business Head, PeopleStrong HR Services stated that in the 21st century HR moved beyond Employee relations and customers; today HRs’ are required to Innovate. 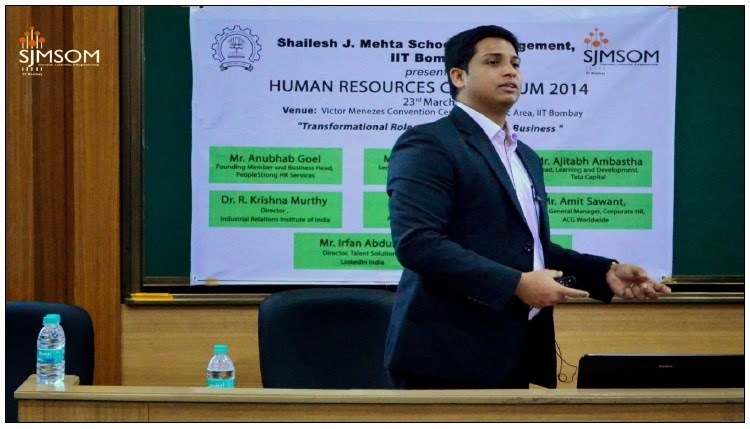 Talking about Transformations of Human Resource, Mr. Anubhab Goel said that Human Resource Managers’ are increasingly taking up roles of Strategic Business Partners. Hence the role of HRM is becoming increasingly more prominent. Human Resource Manager’s are now using lots of analytics and lots of transparency through which it is building big data. All transactional boxes can now be clubbed as Processing Hub: Customer service, analytic center, transaction center, governance center. Major HR responsibilities now include designing cost effective rewards for employees, developing and sustaining a workforce, mitigating employee related risk. Our second speaker Mr. Kishore Poduri, Senior Vice president, Head-HR, DBS Bank (India) began the session by mentioning how innovation evolves and he stressed upon the point that homogeneous groups dampen the innovation and heterogeneous groups foster the innovation. Innovation is a new method, idea, product etc. Purpose, values and culture are the vital parameters in any company success. It is the culture which motivates the employees to go in the right direction and aligned to the values of the company, which is totally enabled by HR function. To bring in innovation every employee should take the ownership in the business he/she is involved in and acting swiftly to the changes plays an important role. And there should always be fun element to make processes lively and at large it yields maximum output and encourages all the stakeholders involved. 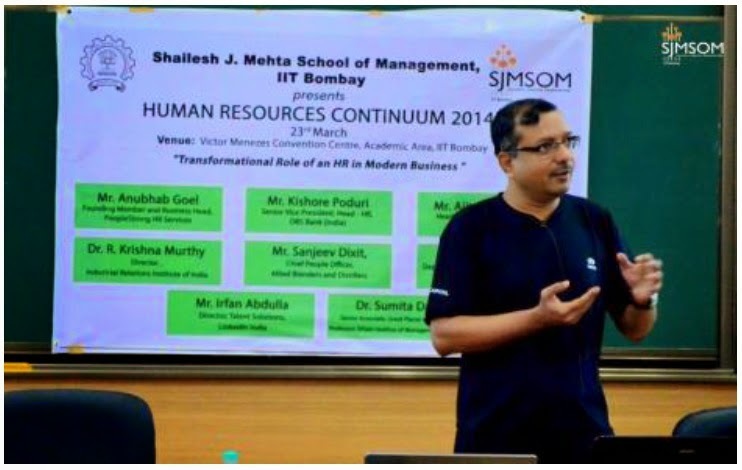 And he focused on HR as lead enabler in the company and he explained how it helps employees to come up with ideas and embed values in the system. Our third speaker Dr. Ajitabh Ambastha, Head Learning & Development, TATA Capital, linked the assets and processes to state that these are the two factors that strongly influence the performance. He put this in a mathematical model: Assets x Process = Performance. He moved on to speak of reputation and brand as competitive advantages. The people, systems and process of an organization can be copied. It is the Culture and Execution of Strategy that are the two differentiating factors. 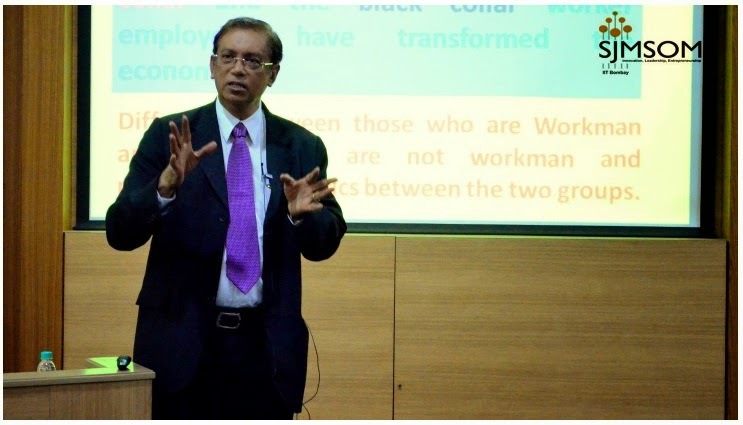 Mr. Ajitabh then moved onto the topic of PCMM – People Capability Maturity Model. It is a framework that focuses on continuous improvement and development of human assets. Our forth speaker Dr. R. Krishna Murthy, Director, Industrial Relations Institute of India, started the session by clearly stating that businesses at present are operating in an environment of ambiguity and high degree of unpredictability. Moving on to the next issue of relationship dilemmas, Dr. Krishna Murthy mentioned that the major goal of relationship management is to maintain harmony and to manage performances under conditions of conflicts and tension. Citing an example of labour unrest, he commented that most of the problems arise because of the lack of communication and dialogues between the concerned parties. The common norm is to decrease the communication instead of increasing it once tension is being created. He emphasized on the importance of engaging into dialogues to break the deadlock in such scenario. Our fifth session was a panel discussion involving Mr. Sanjeev Dixit, Chief People Officer, Allied Blenders and Distillers and Mr. Amit Sawant, Deputy General Manager, Corporate HR ACG Worldwide. Prof. Ashish Pandey, who served as a moderator in the panel discussion, introducing the topic “Are students from elite business schools delivering the results in the corporate world as expected?” and also explained about primary research for choosing this topic. Mr. Sanjeev expressed that Elite colleges expected to have better quality, expected ROI and Value Proposition way higher than other colleges. 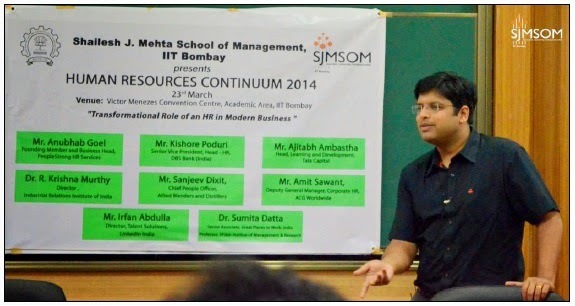 Mr. Amit Sawant thought process went to recruit graduates from not so elite colleges. Graduates from non elite colleges might not get same salary as from elite colleges but when looked after 3 or 4 years they might end up getting same salary. Our sixth session was taken by Dr. Sumita Datta, Independent Consultant and Professor at SP Jain IMR. She began the session by discussing the different generations at work places – Baby boomers, Gen X and Gen Y. She went ahead detailing some of the personality traits of each generation. Dr. Datta then moved on to speak about the problems that arise with different generations working at the same place. She highlighted how both Gen X and Gen Y are eyeing the top post of baby boomers. The session moved towards discussing how these two generations are very right in their expectations and how the personality differences in Gen Y need to be handled by organization. Our seventh session was taken by Mr. Irfan Abdulla, Director, Talent Solutions, LinkedIn India. He started his session with a simple yet relevant thought- “Access to information is not the most important thing, what is important is quick access”. He said that out of the 670 million workforces in the world, 277 million are on LinkedIn, and it is flourishing because of the details it provides about the person. The ‘identity’ and the ‘insights’ on LinkedIn are unique. A Google search of your name brings your LinkedIn profile as the first result. There are several thought leaders, amongst the 1.5 plus unique publishers on LinkedIn, who write insightful articles. Mr. Irfan also talked about the best practices of Social Media recruiting. He stressed upon the importance of understanding the target audience, measuring results and engaging top talent. He said that recruitment has moved from backroom to boardroom. The continuum ended with a vote of thanks by the student co-ordinator for the Humane Club. 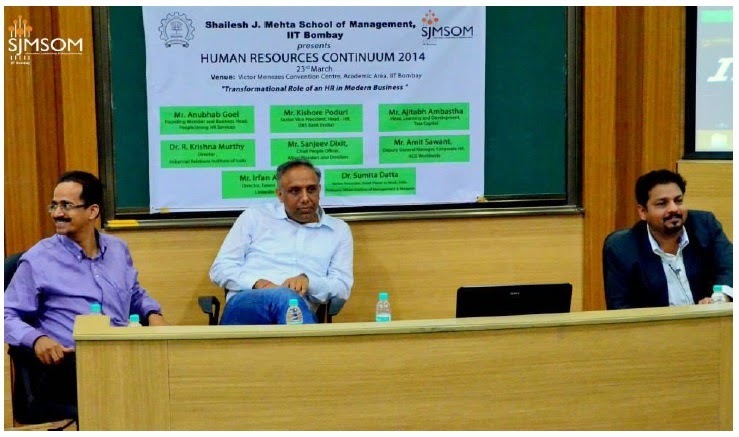 Human Resource continuum 2014, which saw a perfect blend of stalwarts from industry and academia, was a great learning experience for all the students of Shailesh J. Mehta school of Management, IIT Bombay. This is jonesdruman This blog was simply great post byb you. I really appreciate your blog. 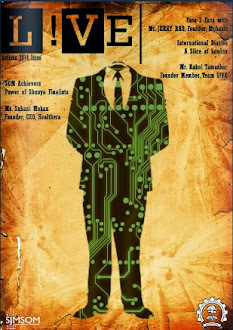 Really awesome blog I would like to know more about this. Please give some ideas about your blog. Thanks…………………………………….
. You can easily Root the Android Device with Latest Kingoroot Apk[4.0]. valuable post! I really like and appreciate your work, thank you for sharing such a useful information about human resource cororate social responsiblity strategies, keep updating the information, hear i prefer some more information about jobs for your career hr jobs in hyderabad . Inspiring writings and I greatly admired what you have to say , I hope you continue to provide new ideas for us all and greetings success always for you..Keep update more information..
I’m planning to start my blog soon, but I’m a little lost on everything. Would you suggest starting with a free platform like Word Press or go for a paid option? There are so many choices out there that I’m completely confused. Any suggestions? Thanks a lot. Fascinating casino life online. best online gambling sites Play online casino at BGAOC. Truly a very good article on how to handle the future technology. After reading your post,thanks for taking the time to discuss this, I feel happy about and I love learning more about this topic. Excellant your post and blog.